Every teenager growing up in the 90’s had that one CD that they weren’t proud of, and along with it came the fear that one day that CD would be discovered by their peers. The teenager would then be exposed as the dork that they really were, resulting in immediate banishment from their group of friends, thus upheaving their small but infinitely cruel world and causing a breach in the space-time continuum. For me, that fear materialized my junior year when my friend Joe Wood and I decided to ditch school and drive to New Orleans. Before I tell you about that, let me tell you this: I was born in 1978. I missed out on the punk, electro, glam rock era that later took a Quaalude and reinvented itself into the 90’s Debbie Downer grunge rock scene that was destined to soundtrack my angst-ridden Doc Marten-clad adolescence. So for me, David Bowie started out as the Goblin King. David Bowie as Ziggy Stardust, David Bowie as Major Tom, David Bowie as the Thin White Duke, East Berlin Bowie—all of that would come, but it would come much later, in the form of almost mandatory listening during my avant-garde wannabe college years as a highly impressionable, tortured film major. But first, there was the Goblin King. My Dad took me to see Labyrinth. It was 1986. I was eight and my parents’ divorce was just around the corner, though I didn’t know it yet. I walked out of the theater taking away two ideas that I thought to be absolute truths: that one, when I grew up, I wanted to look like Jennifer Connelly (didn’t happen)—and two, wow, that David Bowie could sing! A weird one, for sure. All that silver latex and make-up. The spikey white hair. That bulging whatever-it-was coming out of his you-know-where. For a while those ridiculous but somehow hypnotic Labyrinth songs floated through my head almost daily, sometimes for no reason, sometimes for exactly the right reason. Jump, magic, jump, I heard Bowie sing during my escapades on my neighbor’s trampoline. Down in the underground, Bowie would sing while I whittled away knee-deep in dirt building mud houses. Bowie sang to me in the not-so-good times, too. On the day my Dad informed me that he and my mother were divorcing, Bowie lullabied me to sleep with it’s only forever…not long at all (As the world falls down, I’ll be there for you was also a popular refrain that year). Gradually, as the years slipped away, the songs did too, but Bowie did not. His captivating baritone had left an imprint in my brain, holding a place among the other remaining threads of innocence and endless possibilities that were slowly being stripped away as I prepared to enter the warzone of a junior high hallway. I wouldn’t hear the Goblin King again until high school, during a chance stop with my dad at Hudson’s Salvage Center. Buried beneath a pile of a half-burnt cassette tapes, the Labyrinth soundtrack was waiting for me. I recognized Bowie’s spiked hair right off the bat and snatched up the tape and held it close to my chest. My breath quickened with excitement. You would have thought someone had handed me the moon. My dad raised his brows when he saw what his teenage daughter wanted him to chuck out four dollars for. “Are you sure?” he asked. I nodded. He smiled and a twinkle of hope entered his eyes—viewing this, I suppose, as a sign that his little girl was still there somewhere under all that plaid and dark eyeliner. I probably played the Labyrinth soundtrack just as often as I played my other albums. I had my own car by then—a 92’ red Geo Prism that I frequently drove with similarly grungy plaid dressed friends in tow. My music collection was mostly CDs by that point, but I still had cassette tapes, and I made sure to bury the Labyrinth tape under the other tapes where my friends wouldn’t find it—sometimes even sticking it under the seat when I had a full ride. For two years, my nerdy, age-inappropriate Labyrinth soundtrack went undetected. Then one day Joe Wood, the guy who my peers had unanimously if not officially accepted as the Coolest Guy at School, and who also happened to be my best friend, asked me if I wanted to ditch school and drive to New Orleans. I drove. As the passenger, Joe’s responsibility was to ration out cigarettes, look out for cops, and play the DJ—ensuring that Green Day, Smashing Pumpkins, Nirvana, and Oasis stayed in a constant and well-distributed rotation. I looked over at him, my face one big question mark. Joe shrugged. “I’m so sick of this album,” he said. He opened my glove box and began rummaging through my CDs and tapes. I’d like to say I started panicking then, but I don’t think I did. It didn’t really dawn on me that he might find my embarrassing tape, so the dread didn’t hit me until after he had already found it, and was holding it up so I could see it. 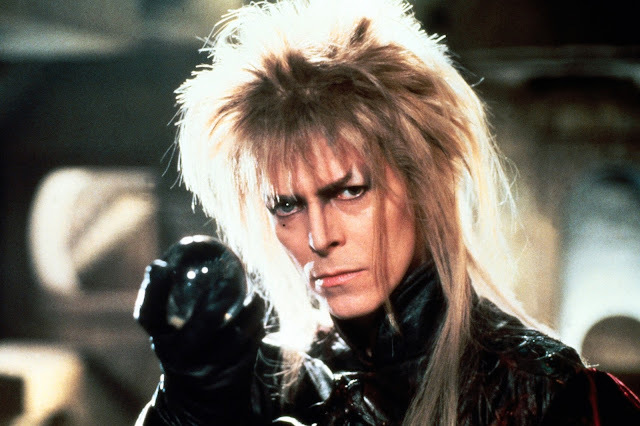 And see it, I did—David Bowie in full Goblin King drag, the title “Labyrinth” in looping medieval sprawl at the top. “What the hell is this?” Joe asked. I’m pretty sure my face went as red as the paint of my car. “It’s…” I began, and stumbled. It’s what? It’s my little sister’s? But Joe knew I didn’t have a younger sister. The previous owner’s? But I’d had the car for over two years, he wasn’t going to buy that. As I continued to search for the perfect lie, Joe pushed the tape into the player. David Bowie’s perfect voice spilled out over the speakers. I thought, how could something so beautiful also be so incriminating? I wanted to crawl under the floorboard, but instead I puffed on my Camel like it was life support and kept my eyes glued to the road. Gradually I built up the courage to look Joe’s way. A small smile had crept along my friend’s lips. He straightened up and readjusted his leather jacket before curling back into the seat again, arms folded, as if he were in a theater waiting for the show to start. “I remember this,” he said. His hand reached up to the player, turning up the dial. Bowie grew louder. I began to relax. For the next I-don’t-remember-how-long, Joe and I listened silently to the Goblin King sing, and a sense of peace came over me. All those how-to-raise-a-teenager books talk about a teen’s constant need to fit in, to find a community, a solidarity with other teens. Well, Joe and I shared a mutual community and for the most part we were happy, but there was still a need, I think—the need to step back and become an outlier for a second, to be the same and yet different, and have someone see it and understand it and say, yes, me too. Maybe that’s why I was at peace. Joe found the dorkiest piece of me and seemed okay with it—even better than okay, he seemed to be enjoying my dork artifact too. When the beginning chords of Magic Dance trickled over the speakers, I glanced over at Joe and he looked at me and we laughed, warm waves of exuberant joy washing over us. You remind me of the babe, I mimed, pointing at Joe, the Coolest Boy at School. What babe, Joe mimed back, raising his arms at the elbows, palms flat facing skyward. The babe of the power. You, remind me of the babe! Minutes of car seat dancing and head bopping ensued. We pointed at cars driving past. What kind of magic spell to use, we asked the unsuspecting drivers. Slime and snails? Puppy dog tails? We laughed. We laughed and laughed and sang some more. “Long live the Goblin King!” Joe cried at one point. “Long live the Goblin King,” I agreed, and at that, the car went silent. When my car closed in on the entrance of Lake Pontchartrain Causeway, Joe suddenly straightened again and reached over, ejecting the tape and placing it back under all the other tapes in the glove box. He lifted a Camel from the dashboard and lit it up before rolling down the window. Small circles of grey smoke evaporated into the day. A little later I heard Joe say, “Not a word of this to anyone.” I agreed. Smashing Pumpkins stayed on the speakers for our whole trip back. That day in the car, my daughter was controlling the music, as she normally did. At a stoplight I looked over to see her scrolling through my IPod, lips curled downward in a frown. “Who are you looking for?” I asked. Aw, Space Oddity. I mentally patted myself on the back. My daughter was eleven and knew Space Oddity Bowie—or at least, knew his music. Unlike my own parents, I shared cool tunes with my children. “His name is ‘David Bowie,’” I said. Out of the corner of my eye I watched her scroll with lightning speed through the artists’ names, stopping only until she got to D. Her finger hovered over “David Bowie” before pressing down. My attention returned to the road. A few seconds later I heard my daughter sigh dramatically. “It’s not here,” my daughter replied with a pouted lip. “What’s not here?” I asked. “Labyrinth,” she answered, using the tone of voice she commonly used when I have disappointed her by not reading her mind. She looked up at me with eyes shaped like mine but in a different color. “Isn’t David Bowie the Goblin King?” she asked. “I guess it’s not in my ITunes,” I said with a shrug. It was my turn to groan. “That’s a lot of data, to stream a video,” I said. I loved that moment so much, but I hated it too, because I knew in a few years, my daughter wouldn’t be complaining about the Bowie song collection on her mommy’s iPod for a long time. Maybe she wouldn’t complain ever again. The teen machine chews us up then takes forever spitting us back out. I think in some ways we never leave high school. Fast forward again. It’s a morning two months later and I woke up and immediately reached for my phone to find out what happened in the world while I was sleeping. On Facebook I spotted a post from another high school friend. It was a link to a Labyrinth song, and I feIt a light prick of regret. I thought, I should have told her about my tape. We could have goofed off too, just like Joe and I did that day. And maybe, maybe, just maybe, it was bigger than that. Maybe if we, if all of us, stopped feeling ashamed all the time, maybe if we set our secrets free, confided in each other, no matter how silly our secrets, no matter how ashamed, maybe we’d all feel a lot less alone and afraid. That was my first train of thought. There’s a cosmic lesson in this. But then someone else—another friend, non-high school this time, had posted something else about David Bowie, and a slow tingle of dread began crawling up my spine. Multiple posts about one celebrity—a celebrity who hadn’t been out there, hadn’t been hawking a movie or getting accused by fifty plus women of sexual misconduct, a celebrity whose main claim to fame these days was simply their legacy and who lived in the ether and you knew them because everyone knew them—to see their sudden bump in popularity on social media—that couldn’t be a good thing. That was never a good thing. My boyfriend was still asleep when I arose from the bed. My arms found the inserts of my robe and my phone found its headphones and I left the bedroom and walked into the living room. I threw myself on the couch and opened Spotify, then closed my eyes and drowned myself in everything Bowie. When Magic Dance popped up, I pressed “Repeat” over and over, head dizzy with nostalgia, thoughts pressed like pictures to a photo album, feeling waves of euphoria and grief all at once, like I was seventeen again and sharing a brief, final moment with an old, dear friend.